As you know, last week Steve and I put a stop to our ridiculous sham of a things-to-do column, which for a handful of hilarious weeks provided us and our tiny cult following (i.e. our colleagues, i.e. the people that are paid to be our friends) a few good belly laughs. We finally realized that was selfish, and now it’s all about you! Because that’s literally what we’re here to do, to serve you. So, we’re now ranking “The 7” based on level of excitement, quirkiness, interest, quality, whatever… and have officially moved on; Steve, we move on! And with that, there’s two kinds of Long Beachers in this world: Those that avoid the Grand Prix at all costs (if so, you’ll love this list, with things to do starting as early as Thursday that are as far away as Los Angeles) and those that love the Grand Prix or don’t mind it (if so, click here for all the fun and noisy events surrounding the noisy race). The LA Art Book Fair is something I’ve never been to since I never leave this town and am an actual hermit, but I can confirm that among the community of local artists that do dabble in Los Angeles things and going outside, there are always a handful who either attend or show their work and also ask if I’m going, which I respond “Maybe this time!” and then step back into my dark, damp closet of introversion and fear of large crowds. With almost 400 contributors from 31 different countries slated to show at this year’s gathering, I imagine it’s something like the LA Art Show (which, wow, I’ve been to). I’d think of it as a cross between the massive, overwhelming event held at the Los Angeles Convention Center and the much-loved, much smaller Long Beach Zine Fest where the art of self-publishing is queen. The fair is actually the West Coast iteration of Printed Matter’s New York Art Book Fair, which arrived in Los Angeles in 2013 and grew from 15,000 attendees to more than 38,000 in 2017, according to Hyperallergic. Very sadly, the show’s curator passed away that year so organizers decided to cancel the 2018 event to regroup. Now it’s back and bigger than ever. From zines and DIY publishers, to books produced by galleries and collectives, to discussions, workshops, screenings and performances, there should be something for everyone. Another great thing: If you’re staying out late in Los Angeles on Saturday, there’s a celebration of LAABF where Long Beach’s own Senay Kenfe, among DJs Straight Honey, Selam X and Second Wind, will be playing at Cafe Club Fais Do-Do. At this fourth edition of Hands Down, expect funk, soul, disco, house and experimental music; bring your dancing shoes. Giving us a moment’s pause: Large crowds, social anxiety. LAABF is at The Geffen Contemporary at MOCA (152 N. Central Ave., Los Angeles, CA 90012) and opens Thursday night. You can purchase tickets for the opening here until Thursday, otherwise you can go Friday through Sunday for free. For more info, visit the website here. And, if you feel like clicking on yet another link, the Facebook event page has a ton of info, too. Hands Down runs from 10 p.m. to 2 a.m. on Saturday at Fais Do-Do; 5257 W. Adams Blvd., Los Angeles, CA 90016. Guests must be 18 or over. For more info and tickets, visit the event page here. Back in Long Beach where it’s safe, (unless you’re near the Grand Prix) Brazilian guitarist and singer Denise Reis will perform at the home of Gloria Arjona, a—from what I can tell—wonderful woman, who has traveled the country bringing lessons on Latin culture and history to various venues. Now, she and Veras Heartbeat Music are bringing Reis to Long Beach, an absolutely charming musician who was born in Belo Horizonte, started playing guitar at the young age of 10 and has since recorded two albums and traveled the world to woo audiences from Ukraine to Portugal. Another great thing: Free parking and light appetizers. You can also bring your own wine and hors d’oeuvres. Giving us a moment’s pause: Apparently, the Dalai Lama gave Reis a standing ovation. Are we even worthy of this angel’s presence? The show runs from 7:30 to 10 p.m. at Casa Arjona, 4515 Harvey Way. For tickets, click here or call Javier at (213) 880-4187. If there’s anything to know about Wilmington-based art collective, Slanguage, it’s that co-founders Karla Diaz and Mario Ybarra Jr. take fun seriously. In fact, Ybarra used the term “funify” several times when describing how they curate playful exhibitions and even their current exhibition at Cal State Long Beach’s University Art Museum. So you can bet this upcoming Performing Arts Festival at the UAM will, at the least, be really fun. As in, maybe you should show up in a fire suit, fun. While Ybarra was not speaking directly in reference to the festival, I think you get the point. Any event where Slanguage is involved should be attended. The Bob Cole Conservatory Laptop Ensemble of CSULB is slated to perform; talk about experimental. 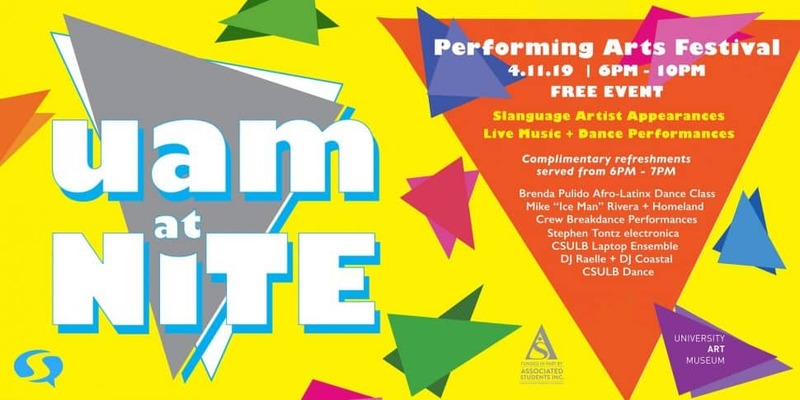 Also on the docket: Afro-Latinx dancing and drumming, CSULB’s dance department performing The Return of Pluto, live DJ sets and someone named Stephen Tontz jamming on a keyboard. Not to mention, you’ll get to meet Slanguage artists while munching on free refreshments. Another great thing: One of the performances is by Mike “Ice Man” Rivera and the breakdance crew at Homeland Cultural Center. If you live in Long Beach and also under a rock and haven’t seen one of these high-energy sets yet, expect a lot of spinning and winning. Giving us a moment’s pause: Admission to the UAM is always free, but parking is not. You’ll have to pay about as much as you would to get into MOLAA (where parking is free, but admission is not) to park your car there. So ride a bike or at least carpool. It’ll save you a few bucks. The festival runs from 6 to 10 p.m.; 1250 N. Bellflower Blvd. Click here for more info. Chomp vs. Warhead; courtesy BattleBots. What’s more metal than metal-eating monster robots made of metal? Not much. 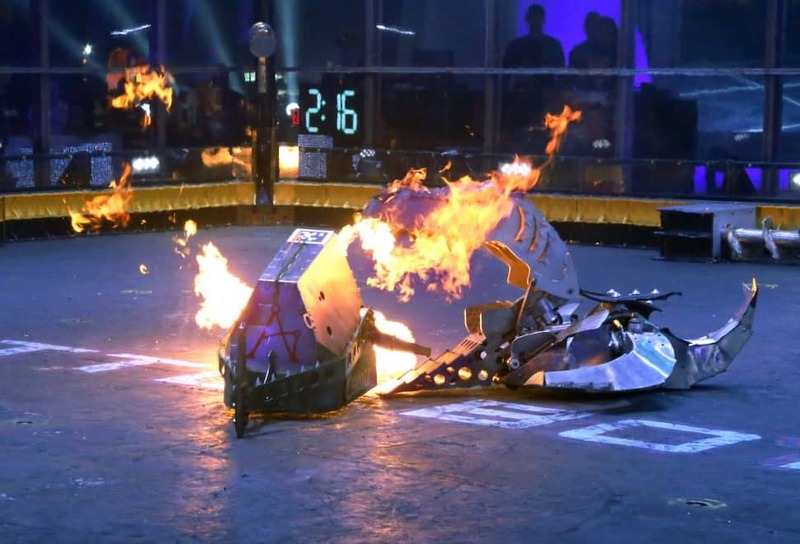 Filming begins Friday for the Discovery Channel’s BattleBots series when robots with intimidating names like “Minotaur”, “Tombstone” and “Yeti” will attempt to take the crown from defending champion “Bite Force” by sheer force, fire and brimstone. But if a robot grinds its gears and no one is there to hear it, does it make a sound? BattleBots first and foremost need an audience to witness these matches before the 16-episode series airs this Spring, and that’s where you come in. Another great thing: You’ll have to put your phone away for this one, since no photos or videos can be taken. That’s three to four hours of phoneless fun! Who knew such a thing existed? Giving us a moment’s pause: BattleBots’ PR team always markets this event as “descending upon Long Beach”, but the studio where these epic fights to the “death” take place is technically in Lakewood. C’mon, someone throw Lakewood a bone! They have parking! This weekend there are still some tickets left to spectate in the tunnel (where the robots enter and you’re most likely to be seen on camera). There are also spots left to spectate during the week. Click here for more, and very important, information and to buy tickets. BattleBots Studios are at 2770 Industry Ave., Lakewood, CA 90712. Photo by Delisha J. in “The World Through My Lens” at Cultural Alliance of Long Beach. Courtesy Hayley Iwig. 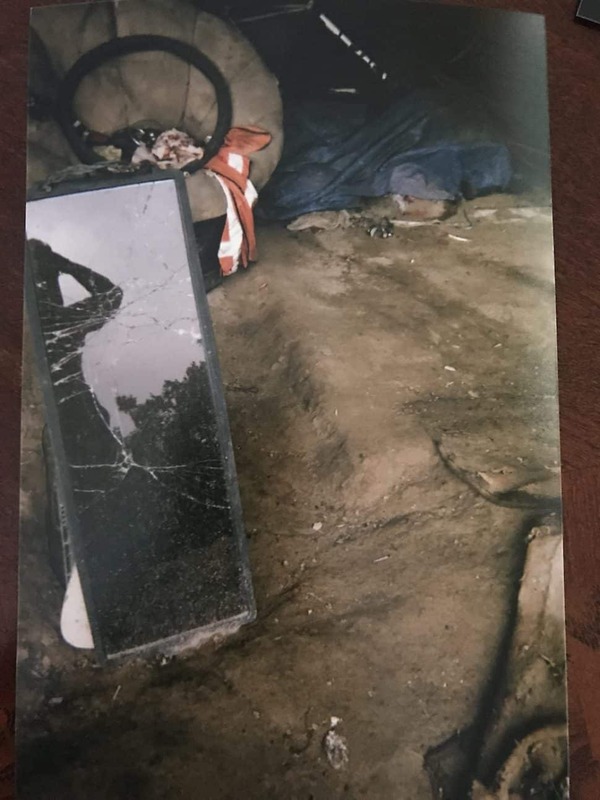 A group of homeless individuals was given disposable cameras to document their day-to-day lives; a project organized by four Masters of Social Work students at Cal State Long Beach. The result: photos taken from a rarely seen perspective, that of those living on the streets of Long Beach. Another great thing: One of the photographers in the show, Rachel M., is a musician and a singer who will be performing at the opening. One of the photos she took is a beautifully grainy depiction of a piano she enjoys playing at a local community agency. Giving us a moment’s pause: This entire exhibit should make you pause. The opening runs from 6 to 10 p.m.; more info here. The entrance to Cultural Alliance of Long Beach’s gallery is in the alley (Salana Court) behind 737 Pine Ave. Look for Suite B and a door marked with the organization’s logo. Art by Oscar Duarte. Courtesy FA4 Collective. Another great thing: The C.U.T.S. (Clean Up The Streets Crew) is all about providing venues for underserved communities to create. During the opening, they’re going to assemble their Mobile Graffiti Yard for anyone to try their hand at live painting. Giving us a moment’s pause: We’re good. The opening reception runs from noon to 4 p.m. on Saturday. Angels Gate Cultural Center is open Monday through Friday 10 a.m. to 5 p.m. and Saturday noon to 5 p.m. Admission is always free. 3601 S. Gaffey St., San Pedro, CA 90731. For more info, visit the website here. The tiny troupe that could, East Village Caravanserai is a small operation hell-bent on making sure the high art of theatre is accessible to everyone, whether they’ve asked for it or not. Last month performers sang opera on the street, with this upcoming production to be no less alternative, this time transforming the East Village Arts Park into a tent “city” hung with blankets and sheets while University of Redlands opera students put on an interactive show. 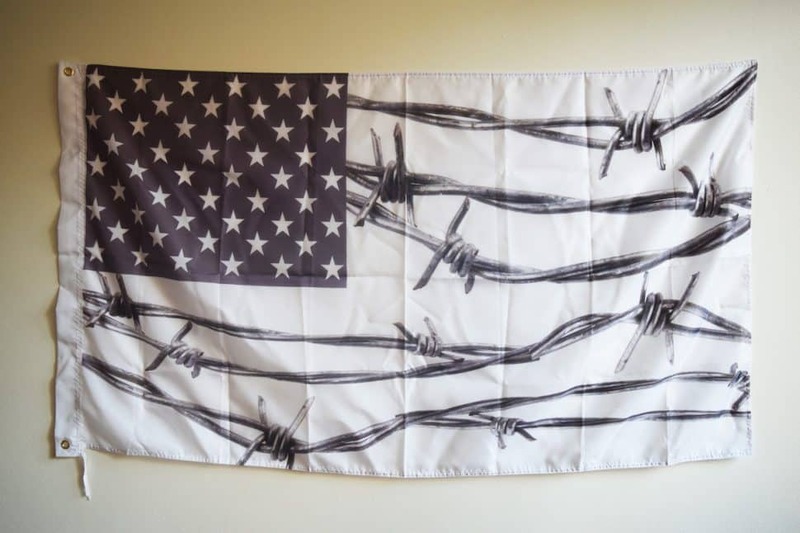 This is a take on an Italian opera that premiered in 1781, Mozart’s “Idomeneo”, localizing age-old themes of exile and displacement with homelessness and immigration. 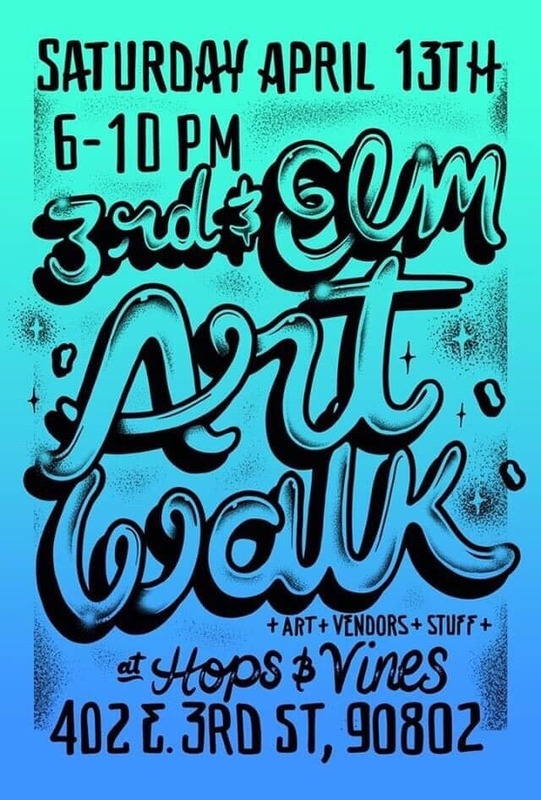 All this takes place during the monthly art walk in the East Village where businesses, including Hops & Vines, have been doing their best to promote artists and create a buzz despite a transition in leadership. Hops & Vines owner Roger Maida suggested checking out anywhere from Fourth to First streets in between Linden and Elm avenues. Another great thing: The blankets and sheets used for the set design can be taken home by “any persons sleeping rough at show’s end,” according to the press material, while any new pairs of socks attendees donate will be given to those experiencing homelessness. Giving us a moment’s pause: The art walk is going through a transition, just like the “arts district” it’s in—both have been pretty dead as of late—but there are certain pockets of activity, such as outside Hops & Vines or the East Village Arts Park, where there always seems to be a crowd or something of interest going on. The Arts Council officially takes over art walk operations in May. 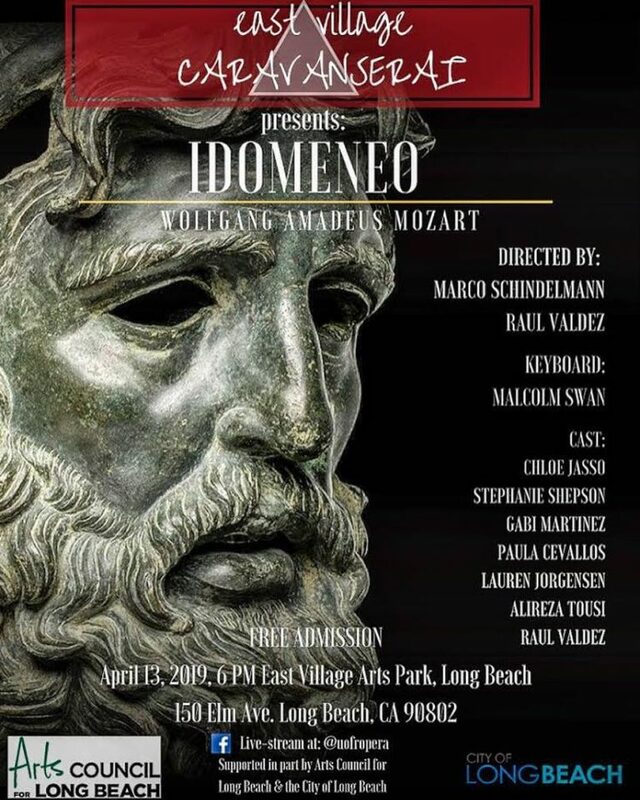 Idomeneo will take place between 6 to 8:30 p.m. at the East Village Arts Park; 150 Elm Ave.